Ireland will contribute at least €1,050,000 to help those most gravely affected by the cyclone. THE IRISH GOVERNMENT has announced it is giving over €1 million in funding to support the thousands of people affected by Cyclone Idai in southern Africa. Tánaiste, Simon Coveney, and Minister of International Development Ciarán Cannon made the announcement today offering their deepest sympathies to everyone impacted by the “truly shocking” disaster. “Rapid assessments, including through EU satellite imagery, have highlighted the vast scale of humanitarian need, which is only likely to grow in the coming days and weeks. It is vital therefore that we step up our international response. “That is why, in addition to our contributions to the UN relief efforts, I am pleased that Ireland will contribute at least €1,050,000 to help those most gravely affected,” Coveney said in a statement. A week after Tropical Cyclone Idai lashed Mozambique, Zimbabwe and Malawi, flood waters have begun to recede in parts, adding fears the death toll could soar as bodies are revealed. Minister Ciarán Cannon described the disaster as one of the “worst weather-related disasters ever experienced in Africa,” adding that Ireland’s response will be crucial over the coming days in order to minimise the loss of life. Irish Embassies in Mozambique and Malawi are working with partners on the ground in response to this crisis, while the Embassy of Ireland in Pretoria is monitoring the effects of the crisis in Zimbabwe, through its office in Harare. €400,000 released by the Embassy of Ireland in Mozambique to the World Food Programme. €500,000 to the IFRC Red Cross response in Malawi, Mozambique and Zimbabwe. 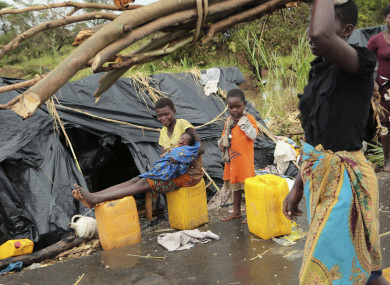 €150,000 in Irish Aid funding allocated to Concern Worldwide for activities in Malawi. In Mozambique, thousands of people were making a grim voyage toward the city of Beira, which although 90% destroyed has become a centre for frantic rescue efforts throughout the region. “The situation is simply horrendous, there is no other way to describe it,” As Sy said after touring transit camps for the growing number of displaced. Three thousand people who are living in a school that has 15 classrooms and six, only six, toilets. You can imagine how much we are sitting on a water and sanitation ticking bomb. In downtown Beira, a sidewalk is Marta Ben’s new home. The 30-year-old mother of five clutched a teary child to her hip as she described the sudden horror of the storm. She said she and neighbours in their home near the beach hurried their many children away but “we lost some of them.” Hers survived. And yet she knows others have suffered more. She described seeing the ragged people who had been ferried by fishermen from communities outside the city. “They looked sad,” she said. “Some were wounded. Some were bleeding. Some had feet white like flour for being in the water for so long,” said Julia Castigo, who watched them arrive Friday morning. She looked resigned. “We survived. We’re still here,” she said simply. Email “Ireland to give over €1 million to Cyclone Idai relief effort as fears death toll could exceed 1,000”. Feedback on “Ireland to give over €1 million to Cyclone Idai relief effort as fears death toll could exceed 1,000”.